This property is managed by owner who knows everything about the property. Owner can be reached by dial eight six five two five zero five two two five. A one-of-a-kind property in the Smoky Mountains! Convenient location and plenty of privacy. Located by mountain and water - whether you're looking to relax or have an action packed vacation, you can find it all here at Creekside Cottage. 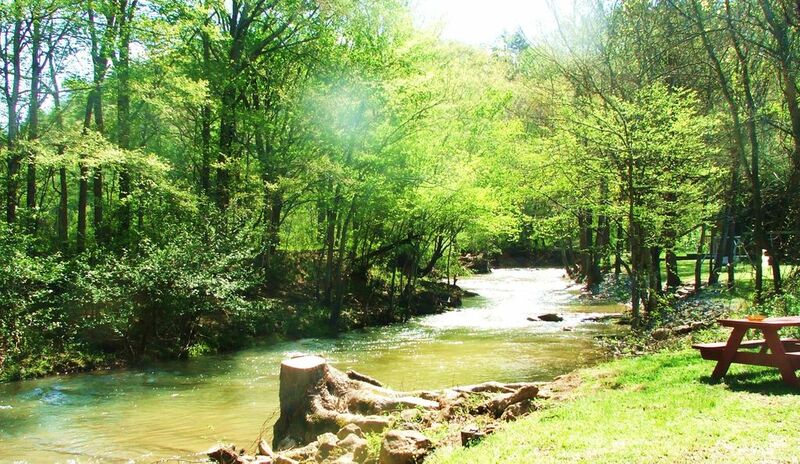 The property is on 1.3 level acres with a private creek front. The cottage has an updated interior, an easy living floor plan, almost everything is on one level. The vaulted ceiling is open to a second level landing with a futon bed. The upstair bedroom has its own private bathroom, shower and jacuzzi tub. The kitchen, with an island and sparkling granite counter tops, is located in the center of the dining/living area. The island is great for entertaining and includes adjustable bar stools. The living area with motorized leather sectional recliners is perfect spot to relax. Enjoy the sound and view of the creek or watch the 52' LCD Sony HDTV with On Demand and HBO. The stranded bamboo floor mimics the look of the flowing water. All bedrooms include TVs. Three bedrooms in the main house plus a futon bed. Each bed is covered with mattress covers and high thread counts cotton sheets for a relaxing nights rest. A screened-in porch with rocking chairs overlooks the creek. Table and benches are perfect for perfect for morning coffee and breakfast. The six person hot tub with led lights, shoulder massager and lounger in the gazebo is located next to the porch overlooking the creek. The Game House is about 20 feet away from the main house. It's quite a hit with bigger groups and great for kids! It is furnished with a pool table, air hockey table, TV, and leather sofa, the bedroom has two queen beds with Serta pillow top mattress. A large bathroom with shower and two sinks. Let the running creek carry the stress away, let the misty mountain air refresh your soul. You will be recharged after a vacation at the Creekside Cottage! Keywords: water front, fire-pit, pool table, hot tub, play area, easy road, paved drive way, 4 or more vehicle parking, Game house, picnic table, fishing, tubing, garden, wifi, HBOs .HDTV. I was a Chemical Fibers Engineer for 13 years and later went back to school graduated in Interior Design. My current focus is cabin rental. One of my goals is to take leadership to make the Smoky Mountain area not only a great place to visit, but also quality places to call home while vacation and enjoy your time spend with loved ones. Please email, text or call me for inquiries or questions. The first time I visited the Smokies, I rented a cabin by a creek and feel in love with the area.This water front property allows me to share my amazing experiences with others. I hope you enjoy the cottage as much as I do! This wonderful property has been with our family since 2008. The consistent positive feedbacks received from renters motivate us to keep the property in optimum shape. Our goal is to allow you to have a worry-free vacation and enjoy time well-spent with family and friends! Convenient, private, creek front, relaxing, bonfire, playset and Game house. The both buildings have new HVACs. New roof and new hot tub installed in 2017. All together 4 bathrooms, 3 shower areas and 2 jet tubs. The kitchen is furnished with slow cooker, can opener, toaster, blender, dishwasher, microwave, ice maker and refrigerator. Great location and the kids Loved the creek and game room! Great, Clean get away with all the amenities! We loved this cabin, we travel this area often and stay in cabins on most of our trips. They take extra care in all the things needed to keep all age groups covered. The cabin was clean and had lots of space to stretch out. Falling a sleep to the creek in the master bed room was relaxing and peaceful. We will definitely be looking to stay at this one on returning trips. This place is in a perfect location to super markets and all the attractions. You just couldn't ask for more! The stream is gorgeous however the cleanliness of the place was horrible. House full of dust ridden artificial flowers - inches of dust visible to just the naked eye on all window sills and what nots. The dining room and bedroom off the dining room smell highly of urine. In addition I rent homes often and this kitchen supplies of cooking utensils / dishes is pitiful. The shelving racks etc where pots pans dishes etc are is disgusting as far as dead insects and just pure dirt where there is absolutely no telling last time it was wiped out. Would not recommend this house - the agent who rented it was accommodating to book however. Hi, the property is kept and cleaned sameway for each group of guests. We are not exact sure why this review came so surprisely different, when most renters give us five stars. We did notice there were over flowing trash bags for a five nights stay and the renter left boxes of beer cans, some of them unopened and dumped in trash bin. There was never any communications from this group. It was Thanksgiving week, we kindly didn't charge this group for additional cleaning up. However, the reviw is not reflecting the truth, but we do appreciate the time spent to write this. May God bless you more in the future! Such a great property for people with kids who love exploring and playing outside. The set up was fantastic! We will return for sure! Creekside Cottage was the perfect property for our vacation. Property had mountain country setting but literally just a couple miles from the busy strip in Pigeon Forge. There was plenty of space for our family of 6 adults 2 teenagers and one child. The screened porch just steps from the creek was the favorite spot for everyone. I would definitely stay at this property again and would recommend it to anyone requiring accommodations for a large group. The ONLY recommendation I would make is to perhaps clear the small brush near the creek and weedeat that area. Thank you, Virginia for a wonderful place to spend our week. Dear Barbara, thanks for the great review, and I totally agree with you to have the fast growing brush trimmed more often. Creek was perfect fit for us. Loved the setting, kids enjoyed the creek everyday. We enjoyed our private oasis away from town but not too far. Perfect fit for our two families, enjoyed dinner every night on the back porch. Thank you for sharing your place with us. Thank you so much Samantha, you have a kind and sweet heart. Smoky Mountain National Park is next to the city Gatlinburg and Pigeon Forge. The area offers Dollywood amusement park, Splash country, varieties of theaters and many more activities for travelers as well as nature exploring. The creekside Cottage has creek front, surrounded by mountains and ridges, total 1.3 ares with a main cottage and a separate Game house.